Swamy made a sensational claim that Gandhi held four different passports and that his MPhil degree, not just showed that he had failed in one of the electives in the course, but also had the name of Raul Vinci. Swamy was obviously referring to the alleged Italian connections of the Congress scion. New Delhi: After a controversy broke out regarding the educational qualification of Union minister Smriti Irani, here is how BJP leader Subramanian Swamy dropped a bomb on Congress president Rahul Gandhi's educational qualifications. 1. Swamy had claimed that Rahul Gandhi failed in his MPhil course at the Cambridge University. 2. Swamy also made a sensational claim that Gandhi held four different passports and that his MPhil degree, not just showed that he had failed in one of the electives in the course, but also had the name of Raul Vinci. Swamy was obviously referring to the alleged Italian connections of the Congress scion. 3. Swamy also tweeted a photograph of the Cambridge degree and it clearly shows that Rahul/Raul failed in one of the subjects. 4. 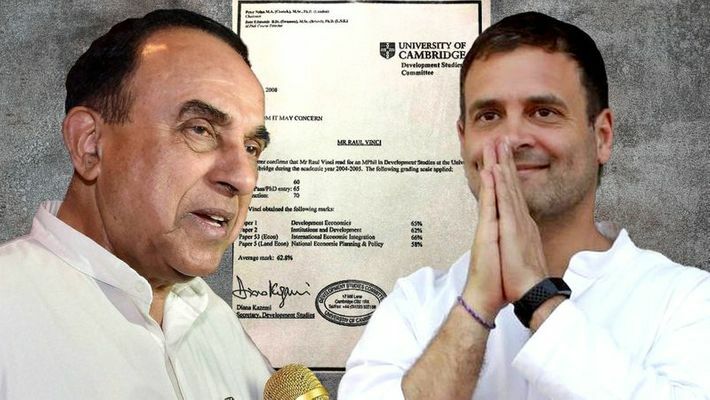 "Buddhu's Cambridge certificate says his name is Raul Vinci, and he read MPhil and failed in National Economic Planning and Policy," Swamy tweeted. 5. In yet another tweet, Swamy lampooned Congress spokesperson Surjewala over the same issue, asking Gandhi to produce his thesis or exam results in public. "The scatter-brained spokesperson is now ranting about Smriti Irani’s degree. Buddhu has also in his nomination form falsely claimed that he got MPhil degree. He failed the pre-Thesis exam so so not permitted to write his thesis. Ask him to produce his thesis or exam results proof," Swamy tweeted. Recently, the Congress attacked Irani after the Union minister declared in the poll affidavit that she is not a graduate. Congress spokesperson Priyanka Chaturvedi said in a press conference that a new serial is going to come which will be titled ‘Kyunki Mantri Bhi Kabhi Graduate Thi’, referring to the popular daily soap that shot Irani to fame: 'Kyunki Saan Bhi Kabhi Bahun Thi’. Irani mentioned in her affidavit that she passed secondary school examination in 1991 and senior secondary school examination in 1993, but did not complete her Bachelor of Commerce course from Delhi University's School of Open Learning in 1994.